This week’s episode: Dear APD. You might not know this, but, outside of the Food Lion Skate Park, it’s illegal to skate anywhere in downtown Asheville. I didn’t know this, and Mom didn’t either, until we ventured out one day — she on her longboard, me running on-leash beside her, and took off for work down the quiet side streets into town. The new issue of our beloved independent weekly, the Mountain Xpress had just come out, and the cover said it all: Skateboarding is a Crime. You can read the excellent story here. It really is a shame. I mean, longboarding (which is all about carving and cruising, not doing tricks–although, Mom wishes she was that good) is a really rad form of alternate transportation. Our final pillow post this month comes from…. me! When I’m not spending my time working on craft books, I’m busy making them. I also blog over at Digs&Bean: stop by when you have a minute. Quilting and sewing are my current favorite mediums. Pair that with a healthy love of fusible web, and you get lots (and lots) of applique, like in this project. I love pillows: they’re quick, fun, and have endless design potential. But I wish my doggies weren’t so keen to wash (er… chew) them, or my house would be even more pillow-riffic. So this week, the contest is a bit different: if you win the drawing, you’ll get a copy of Pretty Little Pillows and these pillows! Of course, you can also make your own. Free Project: Try the Two-Tone Truffle pillows in any color you like! Interested in winning a free copy of Pretty Little Pillows? Each Friday for this month (ending Friday, July 30th), Lark Crafts will post a free project and giveaway offer. For a chance to win that week’s prize, you will need to comment on the post during the times and dates specified. Comment on this post between now and next Wednesday, August 4th by 9pm EST, and you’ll be entered for a chance to win a free copy of Pretty Little Pillows and the Two-Tone Truffle pillows from the book. One winner will be selected at random on or before Thursday, August 5th at 10am, and announced on Friday. Click here for the official rules. Congratulations to last week’s winner, AnneGirl. And thanks to everyone who commented! I grew up in a household with shelves of canned goodies stashed in the basement: beautiful orbs of grapes floating in purple-tinged juice, dark cinnamon-laden apple sauce, and bright green beans standing at attention. Unfortunately, as with many families of the 1980s era that commitment to preserving the best of the season, tucking it away for later was also shelved into a dark corner as our family’s approach to food was affected by the lure of convenience. But just last year, thanks to my involvement in our book Homemade Living: Canning & Preserving, I fell in love with the time-honored craft of canning as an adult. For many of us here at Lark we sometimes find the allure of the topics we publish irresistible. 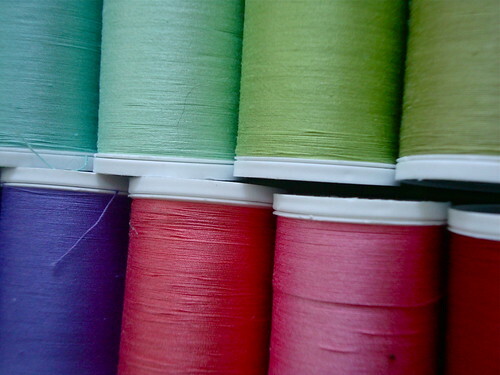 And so we joyfully pick up the needle and thread or, in my case, stock up with a canner and jars. Motivated by the fond childhood memory of my mom’s efforts and armed with Ashley English‘s accessible and common sense approach to the craft, I felt like I really could make the leap. In no time at all my enthusiasm knew no bounds as I quickly found myself whipping up batches of sauces, jams, pickles, relishes, and more. As a passionate foodie AND collector of beautiful objects, I found unabashed delight in preserving the luscious, seasonal treasures from the garden and farmers market into glorious condiments and treats that could not only be displayed like proud trophies on the shelves of my pantry (“Look what I did!”) but also gifted to my friends, family, neighbors. You think those pickles you can get at the store are good? Just wait until you’ve made your own to suit your own tastes (extra spices for me, please!) using cukes you grew yourself. And now with the bounty of Summer produce kicking into high gear again, my mind is simply brimming with ideas for how I can creatively “put a lid on it.” It’s seems I’m not the only one. According to allrecipes.com, fifty-five percent of American home cooks plan to can this year, and of those, nearly 97 percent will be canning more than previous years. This season my adventures have included Raspberry and Blueberry Jam with Lemon Verbena, Classic Bread & Butter Pickles with Red Pepper, and Chai Peach Jam. I’m looking forward to my canning roster changing with the season with Autumn’s Spiced Pear Chutney and Cardamom Apple Cider Butter (both from Homemade Living: Canning & Preserving) on my wish list. Be sure to check out Ashley’s incredibly thorough and helpful post on the topic on Design*Sponge, filled with advice and encouragement. If you haven’t already picked up the jar, you may soon find yourself wooed by its siren call. One of the best things about my job is the treats I receive in the mail, often unexpectedly. 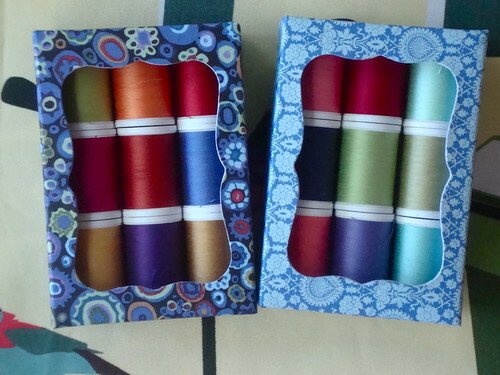 Recently that delight came in the form of tiny care packages filled with the loveliest colors of thread from fiber force, Rowan. 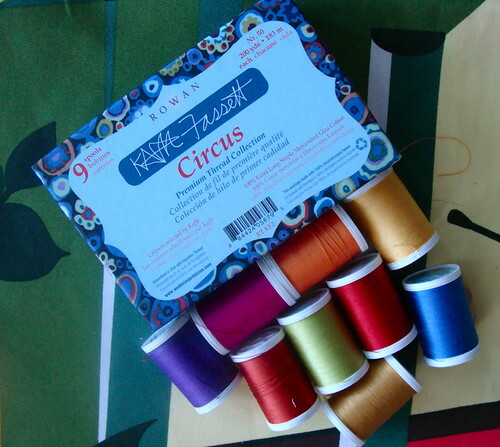 The company has teamed up with sewing world super stars, Kaffe Fasset and Amy Butler to create vibrant and luxurious thread collections, dyed to match their respective fabric lines. 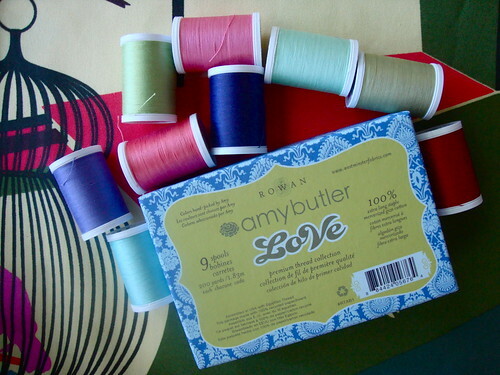 For about $36 bucks, you can have Amy’s “Love” or “Soul Blossom”, or Kaffe’s “Circus” or “Stones” packs consisting of 9 colors (each) of the finest Egyptian Giza cotton thread! Classic, gorgeous and brought to you by the creme de la creme of fiber designers; what could be better? I have to admit, I’m kind of partial to anything that Amy Butler designs and not just because I’ve had the pleasure of interviewing her for my book, Craft Corps. I love her vintage-made-now sensibility reflected largely in her color choices which are always, just a step left of modern. Love Colors L-R: Cool Water, Spearmint, Fresh Lime, Tea Leaf, Periwinkle, Melon, Rosebud & Wine. Kaffe Fasset holds a place on the throne in both the knitting and quilting worlds. He’s a trusted veteran whose usage of color and placement have made him and icon in the industry. 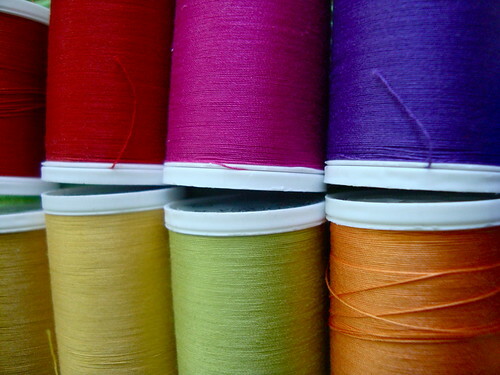 To get your Fassett and Butler thread, buy it online or find a retailer near you by entering your zip code here. This Dog’s Life…Moving to Fridays!!!! Jewelry isn’t just eye candy anymore… It can now be a treat for your nose (well-being and social life) too! I heard about this crazy new technology called “Scentsory Design” from my friend, Meagan, after we saw “Inception” with a group of friends. Along the same futuristic line, Jenny Tillotson has created a jewelry line that sends scent by a wireless web from, say, a spider brooch to another piece of jewelry- like a beetle brooch. It can spray a sample of fragrance to send an aroma ‘message’ that could be healing (lavender), protective (insect repellent), seductive (pheromones) informative or communicative. The user of the piece could whisper a message into the spider brooch, then transmitting the message to a beetle brooch worn by an admirer. Though it may sound a little futuristic, I think the concept of using scent for heightening everyday experiences like watching TV, talking on cellphones and now for fashion, could be right around the corner. … what do you think? Designing your own quilting pattern can take days or even weeks. Not so with the Patchwork Pattern Maker from the Victoria & Albert Museum. This program lets you pick any image from your hard drive and turn it into a quilt diagram. There are plenty of options too. For a quick project you can choose a simple image and go with as few as five colors and a grid of 10 x 10. The more impressive images translate into harder quilts: 20 colors and a 30 x 30 grid with triangles as well as squares. I can’t help it, I’m a T shirt and jeans type of gal. With me, comfort is key. Since Ts are a major mainstay of my wardrobe, I’m always on the lookout for ones that strike my fancy—a gal can never have too many Ts you know. I’m not a big shopper so the internet is a godsend for my virtual browsing. It seems this time my wardrobe search took me abroad to Nikacollection in exotic Istanbul where each shirt is a piece of wearable art. While surfing around the webosphere, I stubbled upon these very charming portraits by Benjamin Hammond. You send him a photo, he will draw your portrait in 60 seconds and send it to you for a small fee. Check out the portraits here. You can see more of Hammond’s design and art direction here. After seeing these drawings, I was inspired to do a 1 minute self portrait of my own. See the results after the jump.